HomeGIS AnalysisWhy Is Location-Allocation Optimal For Site Selection? 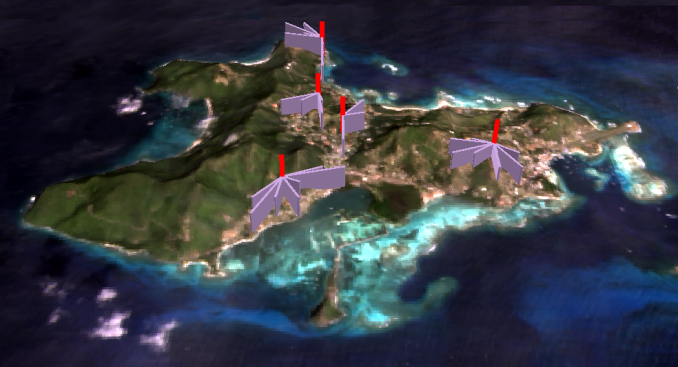 This location-allocation shows 5 optimal locations (red) for fire stations within this island. As location-allocation attempts to maximize coverage, purple lines represent how far their services can reach. Where should you build your store? Location is the #1 factor for the success of a business. Because when businesses know where their customers are located, they naturally have customers rolling in like clockwork. So how do you find an optimal business location? Where should you locate a municipal or city service? Enter the location-allocation tool – a handy tool using the ArcGIS network analyst. …and your island has no fire stations. If you were asked to locate 5 fire stations to maximize coverage, where would you put them? But how did I know where to put them? I used the location-allocation tool because it answers how to serve demand in optimal locations. DEMAND POINTS: Input are points of demand with a weight such as population per point. Where is your population? Or where are potential customers located? Add a weight field if there are more than one per point. Examples of free demand GIS data could be from TIGER census data, SEDAC socio-economic data, Esri’s tapestry segmentation and your local city/municipal sources. FACILITIES: Input is points with a facility type defining if it’s a candidate, required, competitor or chosen site. Where are existing facilities located? Or where can candidate facilities be placed? If candidate facilities are everywhere, then you can run the fishnet tool to create evenly-spaced points in your area of interest. NETWORK DATA SET: Input is a road network with connectivity rules. What is the current road network? In order to get the network toolbar enabled, you need a road network data set part of a geodatabase. Check out this services area tutorial to learn how to make one. Turn on your Network Analyst extension. Add your road network data set. In the Network Analyst toolbar, click Network Analyst > New Location Allocation . One of the most powerful features is how you can solve different types of location-allocation problems. MINIMIZE IMPEDANCE: Good for warehouse problems because it selects optimal locations based on impedance to the facility. MAXIMIZE COVERAGE: Good for fire hall problems because facilities are chosen based on greatest demand within an impedance cut-off. MARKET SHARE: This takes into account competing facilities using gravity models to determine proportion the percentage of demand at each candidate facility. MINIMIZE FACILITIES: This allocates the minimum number of facilities so demand is served given an impedance cut-off. Other types of solutions are for maximizing-capacitated coverage, targeting market share and maximizing attendance. IMPEDANCE VALUES: This can be interpreted as how far people are willing to travel to or from a given facility. For example, when you enter an allowable distance of 5 miles, this is the length a fire department would go to reach a community. This location-allocation solution runs the maximize coverage type of problem. Given existing facilities, location-allocation helps business owners decide where the optimal location should be. You can even add competing stores to target market share. If you were to use one tool to decide the optimal location for a successful business, it would be the location-allocation tool in ArcGIS. ArcGIS has developed a gem to allocate facilities based on demand. Alternatively, you can predict how many customers will patron your store using the Huff Gravity Model. Huff Gravity Model uses store size and distance along with census tract population to understand the probability that consumers will patron retail stores. Can a similar procedure be implemented in QGIS?